I got home yesterday from the ShesConnected Conference in Toronto. It was a whirlwind of a trip... the conference was only for two days but they managed to pack a whole lot into that short time. I think it is going to take me several days to recover! I managed to take an alarmingly small amount of pictures... and at least half of those are blurry... which is odd considering I had my camera on "auto" mode the whole time. Go figure. I got to see some of my most favourite people while I was there and I loved that. 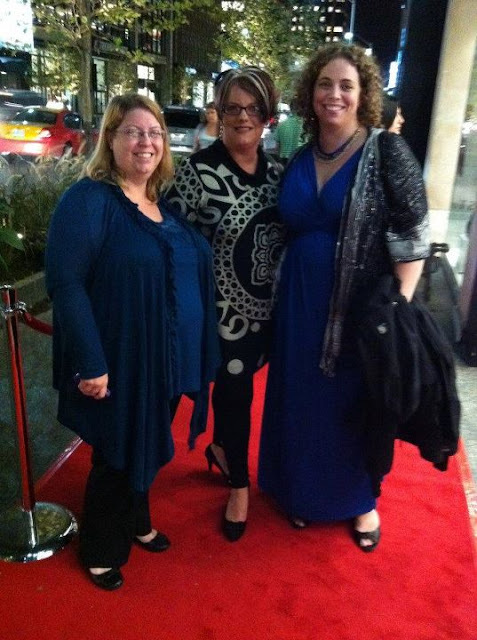 I like this fun picture of me (wearing the pretty dress that Dress911 sent me) with 2 of my fab roommates- @momsmusings and @soberjulie on the red carpet for one of the events we attended. And of course here is my 3rd roommate and dear friend @shasherslife looking fabulous in her Tia Star dress while we were at an event held in a shoe store (true story). We did a LOT of listening to fabulous women speak, we talked with a bunch of brands (or the people who represent them anyway), we rode in a Ford vehicle that PARKED ITSELF which was seriously cool, we barely ate, we stayed up way too late and generally had a great time. My husband Doug has gone away on a week long camping canoe trip with @shasherslife 's husband so she and I are single-parenting it for the week. Too bad she lives 21 hours South of me!! Technically our husbands met for the first time yesterday but we've all been talking online for ages so it isn't as bizarre as it sounds. It would have been horrendously difficult to say good-bye but thankfully I am off to Blissdom Canada in 11 days. YAY!